Copperloy’s aluminum loading ramps are the ideal stage ramps for the concert and theatre industries. They’re durable and safe, and offer quick and easy loading and unloading for all types of equipment. From lighting and sound equipment to speakers or instruments, they’ll provide a more efficient system for getting ready for shows, performances and events of all kinds. 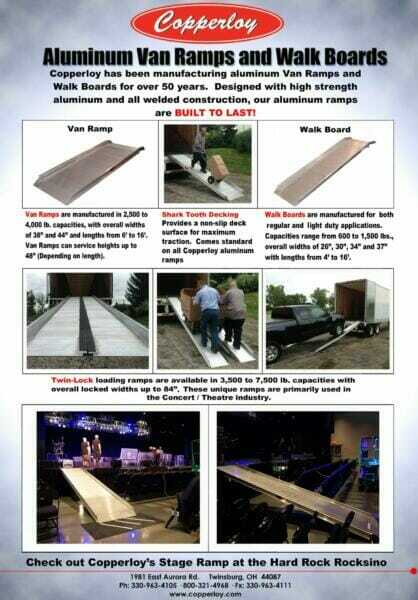 Our aluminum ramps are perfect for stages. In fact, production companies, concert halls, theaters and stadiums have been using our ramps for years! See the video below at the Rocksino using our ramps with their stages! Your venue can rely on the durable and versatile stage ramps for loading sound equipment and other gear from Copperloy. We have more than 60 years of experience, and everything we produce is proudly American made.